WASHINGTON - European and U.S. researchers said last Thursday that wolves likely were domesticated by European hunter-gatherers more than 18,000 years ago and gradually evolved into dogs that became household pets. The researchers studied 10 ancient "wolf-like" animals and eight "dog-like" animals, mostly from Europe to explore the evolutionary history of dogs. They compared mitochondrial DNA, a powerful tool for tracking ancestry, of the animals, which ranged from 1,000 to 36,000 years old, to similar sequences in modern animals: 77 dogs from a wide assortment of breeds, 49 wolves, and four coyotes. They found that modern dogs' genetic sequences most closely matched those of ancient wolves or dogs from Europe, but were not a close match to the DNA from wolves found anywhere else in the world or even with modern European wolves, thus they believed that dogs derived from ancient wolves that inhabited Europe and are now extinct. "We found that instead of recent wolves being closest to domestic dogs, ancient European wolves were directly related to them," Robert Wayne, a professor of ecology and evolutionary biology at the University of California, Los Angeles and senior author of the research, said in a statement. "This brings the genetic record into agreement with the archaeological record. Europe is where the oldest dogs are found." Perhaps wild wolves were drawn to them because they could feed on carcasses the hunters left behind, they said. "Other wild species were domesticated in association with the development of agriculture and then needed to exist in close proximity to humans," Wayne said. "This would be a difficult position for a large, aggressive predator. But if domestication occurred in association with hunter-gatherers, one can imagine wolves first taking advantage of the carcasses that humans left behind -- a natural role for any large carnivore -- and then over time moving more closely into the human niche through a co- evolutionary process." 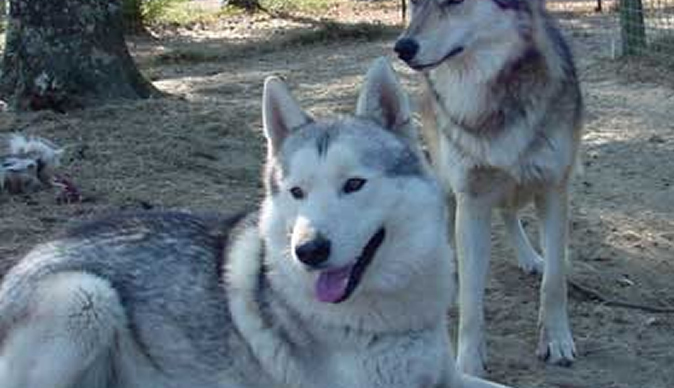 In research published in the British journal Nature in 2010, Wayne and colleagues reported that dogs seem to share more genetic similarity with living Middle Eastern gray wolves than with any other wolf population, which suggested a Middle East origin for modern dogs. The new genetic data have convinced him otherwise. The researchers said they were unable to get suitable ancient mitochondrial DNA data from Middle East or China, two proposed centers of origin. Geneticist Peter Savolainen of the Royal Institute of Technology in Stockholm, who remains convinced that dogs originated in southern China, deemed it a major flaw. He and others also faulted the work for including just a few modern wolves from the Middle East and China but dozens from Europe.